Product prices and availability are accurate as of 2019-04-19 07:27:13 EDT and are subject to change. Any price and availability information displayed on http://www.amazon.com/ at the time of purchase will apply to the purchase of this product. The Guitar Pro 6 Deluxe Soundbank Edition includes Guitar Pro 6.0 plus 6 realistic sound libraries featuring vintage electric guitar, modern electric guitar, acoustic/exotic guitars, basses, keyboards/synths, and drums sounds. Over 100 instruments! 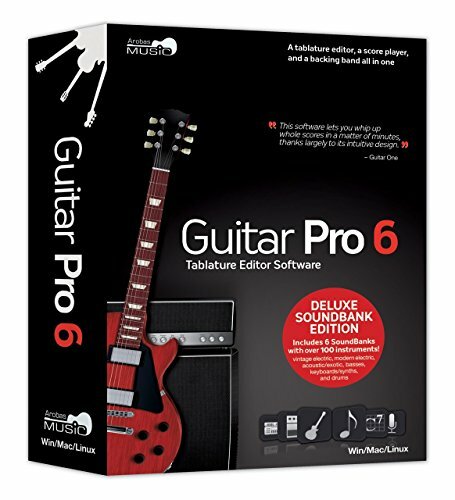 Guitar Pro 6, a Win/Mac hybrid, is the ultimate toolbox for the guitarist! It includes all the tools you need to improve, compose and accompany yourself on the guitar. This simple and intuitive multitrack tablature editor is specifically designed for guitar, bass or other stringed instruments. Guitar Pro 6 features the newest in playback technology including RSE - Realistic Sound Engine. RSE gives you real time playback of your scores with realistic sound samples taken from high quality guitars and real time effects such as wah-wah. Advanced notation features add drum notation, vocal notation and tablature support for any stringed instruments with four to seven strings. The newest version, Guitar Pro 6.0, includes over 40 new features while improving on those that have made it the most popular guitar tablature editor available. Known for its ease of use, Guitar Pro allows you to enter notes by using keyboard keys, mouse clicks on an on-screen fretboard or directly through a connected MIDI device, all in just a few minutes. This revolutionary software can handle up to 256 tracks and you can switch from tablature view to standard notation for viewing or editing scores. Also included in Guitar Pro are a digital guitar tuner, a chord diagram engine, and a scales tool. You can easily import and export MIDI and ASCII tab formats allowing Guitar Pro to be used with a limitless number of songs. Tens of thousands of Guitar Pro format files are available on the Internet. The WAVE Export allows you to convert a Guitar Pro file into an audio file which is playable without Guitar Pro and can be burned onto an audio CD. Includes Guitar Pro 6.0 plus 6 realistic sound libraries featuring vintage electric guitar, modern electric guitar, acoustic/exotic guitars, basses, keyboards/synths, and drums sounds. Guitar Pro 6 is the standard in guitar tablature editing, now with 40 new features, a new interface and mixing table, and more improvements. Provides an optimal display of your score, together with all the tools you need for editing, sound-setting, and playing your instrument. Quickly and easily capture the notes with the keyboard, mouse, or a MIDI instrument, then play back to facilitate composing or learning. Enjoy thousands of scores that are already available over many websites (files in *.gtp, *.gp3, *.gp4, *.gp5 and *.gpx formats).